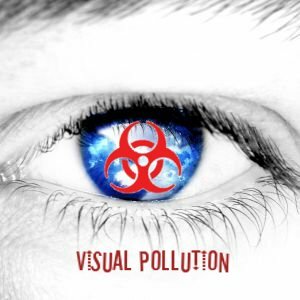 Visual Pollution is a term given to describe visual elements of a landscape or vista that are unattractive or uncomfortable to look at. If pollution refers to the fouling of air, water and land due to man-made activities. Visual pollution can be described as the fouling of landscapes or vistas (“uglification”, if you will). Visual pollution, however, is an aesthetic issue and what is clutter to one man (e.g. billboards) can be a well-placed advertisement to another. Personally, I believe space can say as much as something that is printed. There should be a balance between the two. Billboards can also lend character to their location. In fact, some places are well known for their signs (Hong Kong, Times Square and Las Vegas immediately come to mind). Just recently, the Mandaluyong city government dismantled billboards along the 23-kilometer stretch of EDSA (E. De Los Santos Avenue). These billboards featured members of the Philippine rugby team promoting a brand of underwear. The city mayor’s office says these signs did not have the necessary permit and they believe these can also be offensive to underage children. As long as there’s space, there’s always an ad waiting to be printed – and a sponsor willing to pay for it. Billboards and signs are the usual culprits. But this problem is more complex than it looks. The rise of global brands in today’s competitive business environment has also brought with it the increasing need to be heard and seen. In an attempt to stand out from the crowd, businesses employ non-traditional advertising techniques, which covers a multitude of media, not just billboards and signs. Nowadays we see bus/tram wrap-around stickers, cab signs and even ads on the backs of printed receipts. As long as there’s space, there’s always an ad waiting to be printed – and a sponsor willing to pay for it. Not everyone can go save the whales or protect the rain forests. But we can still do our part to preserve this planet - in our homes and communities.